Items chosen for digitization depend on aesthetic values, as well as traditional research values. Just as good grammar assists verbal communication and standardizes comprehension, aesthetic quality aids in our visual communication. To fulfill their historical research potential and to be reproducible for articles, publications, and exhibits, historical items should have proper focus to render detail, exposure that preserves the full range of tonal contrast, clarity, fine composition, and be in good physical condition—in short, be aesthetically appealing. While these artistic characteristics contribute to composition, materials used in historical research were taken and preserved for more prosaic reasons than art. Archival records are not primarily preserved for their aesthetic value or intellectual content but are expected to serve some useful purpose. Among those most valuable to scholars are items that document people, places, things, and events for the purposes of reporting news, encouraging reform, advertising a product or service, promoting a government program, explaining a scientific or industrial process, or illustrating an idea. What is more significant than an item’s aesthetics, especially during appraisal, are its evidential and informational values as confirmation of its creator’s activities and its subjects. Archival appraisal is distinguished between primary and secondary values. Primary values are those immediate to the creation of the record, its original administrative, legal, or fiscal purpose for its creators. After their first purpose, records can also acquire secondary values for historical research—their evidential and informational values, which are not mutually exclusive. Evidential values reflect the importance of records as evidence of the organization, its functions, its policies, and the operations of the records creator, for accountability and historical purposes rather than legal purposes. Informational value relates to any other uses of records for documentation of society or historical information, providing unique and permanent information for the purposes of research. Evidential values are derived from the context of creation, original and subsequent use, preservation history, authorship, purpose, message, and audience. In order to understand evidential values, archivists should recognize the original intention of the item—its particular cultural use by particular people. This is rarely given within the picture but is developed in its function or context. Photographs with intact original arrangement by the creator are useful as they allow repository staff to infer information from the context and to assume the authenticity and judge the reliability of the accession. The photographer’s notes and other sources should be sought out, preserved, and made available, to add context to the photographs. Archival value in photographs resides in the interrelationship between photographs and the creating structures, animating functions, programs and information technology that created them. Photographs are complex, multilayered objects whose archival values derive from series of interrelationships between photographs and other archival formats. What is invisible are the ephemeral, provenance-based relationships from which archives in original order gain their authenticity. Unfortunately, these interrelationships are often lost during preservation. Evidential value is frequently embedded in the physical structure of the album, its sequence of pages, the placement of images, and the juxtaposition of words and images. The larger documentary universe of which the material is a part is sacrificed in an effort to ensure the long-term physical stability of individual items. The meaning of the album, not simply as a housing for the images, but as a document in its own right, and the information it was compiled to communicate is lost. Additionally, digitization may also obliterate evidential value. The risk posed by digital surrogates is the loss of evidential value due to the destruction of evidence as to the context and circumstances of their origin. Viewing photographs with their archival principles of provenance and original order intact makes determining evidential values possible. Beyond evidential and informational values, intrinsic and artifactual values should also be appraised. Intrinsic value is the significance of an item derived from its physical or associational qualities (based on its relationship to an individual, family, organization, place, or event), inherent in its original form and generally independent of its informational or evidential value. Artifactual value is the significance of an item based on its physical or aesthetic characteristics, rather than its intellectual content. Records with intrinsic value have qualities that make their original physical form the only archivally acceptable form for preservation. These characteristics may include aesthetic quality, content, usage, market value, unique physical features, age, or scarcity. Images with strong artifactual values tend to be the most heavily used images in most repositories. High artifactual value is what users look for in photographs, particularly for images to reproduce, exhibit, or publish. Intrinsic and artifactual values determine whether photographs should receive conservation treatment in their original format or should be reformatted as a copy, and whether special security or access protections are needed. 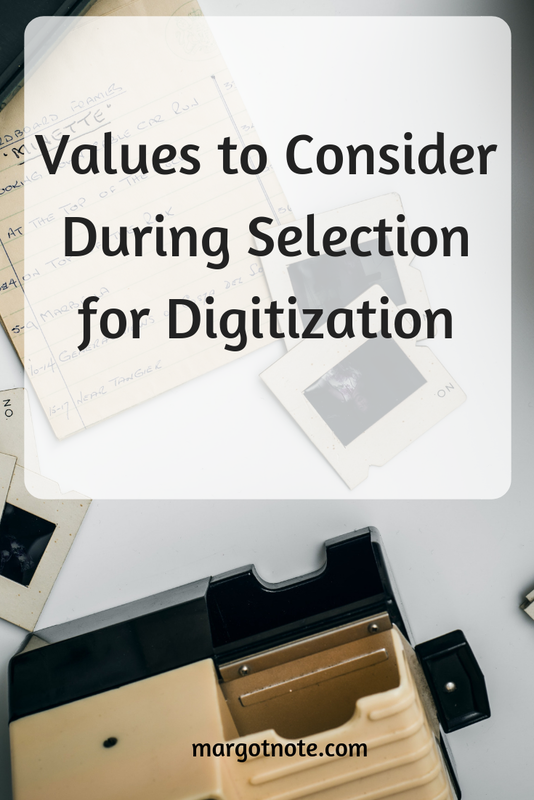 As you select items for digitization, consider the needs, expectations and interests of your user community, and take into account informational, intrinsic, and artifactual values as well as aesthetics.